The February 2017 issue of OVERDRIVE is now out on stands! It's already February... well almost! But yes, the first month of the new year has passed, and so quickly. 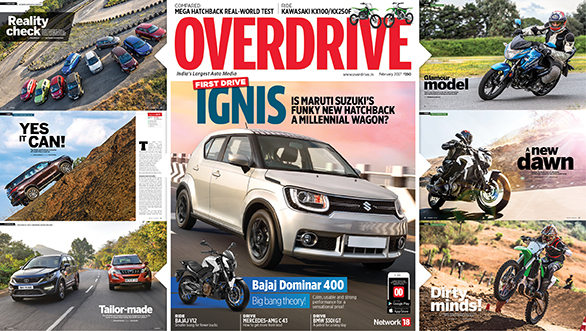 That's good news as far as we know, because it means the next issue of OVERDRIVE is out on stands. We've been very busy all January filling in the pages with stories on the freshest vehicles in 2017. To begin with, Rahul went to Chennai to drive the new, funky Maruti Suzuki Ignis. Being a Millennial himself (although he hates being called one), he wants to find out if Maruti has managed to nail its primary consumer audience. But if one hatchback wasn't enough, he went and compared 10 of them! But not using the most conventional of methods. The OVERDRIVE team devised 11 offbeat tests that evaluate how practical these cars are in the real world. While we can't tell you what they were, we will tell you that there was lipstick involved. Curious? Once that story was done, he went ahead to road test the Hyundai Tucson, before finally letting the roof down on the Mercedes-Benz C300 Cabriolet and enjoining the wind in his hair. Next we have Rishabh going for a long spin in the new BMW 330i GT, under the pretext of road testing it. We aren't kidding about the 'long spin' bit. He couldn't get enough of the car! But once we managed to pry him out of it, he jumped into the facelifted Skoda Rapid to see if the new design and the mildly upgraded engine tickle his fancy. Then he jumped into two made-for-India people movers  the Tata Hexa and the Mahindra XUV500  to find out which one does its job better. Once he got fed up of all things four-wheeled, he went on to review the new 125cc Bajaj V12. Rishaad, meanwhile, was out in the new Toyota Fortuner, getting it to stand at all sorts of angles for his own amusement. To further entertain himself, he went ahead and drove the little brother of the Mercedes-AMG C 63S  the C 43 4Matic. If that wasn't enough, he also rode one of the most anticipated bikes from Bajaj  the Dominar 400. Shumi, on the other hand, had flown several hours to Argentina, where Hero unveiled its latest bike for the global markets  the Glamour. Needless to say, he got behind the handlebar and gave us an interesting story. Ashok, however, was getting bored of riding on tarmac. Fortunately, Kawasaki gave us a call saying they've got the KX250F and KX100 dirt bikes, and they wanted someone to ride it. Guess who we sent. In the motorsport section, Bert gives us his first-hand experience of the awe-inspiring 2017 Dakar Rally. Rishabh, on the other hand, gives us a summary of what happened at the JK 4x4 Fury which was held along with the 2016 Orange Festival. Vaishali, meanwhile, had a go at the 279PS/420Nm rally-spec Skoda Fabia R5. Clearly, Lady Luck seems to be on her side. Last but not least, we've also come up with a huge list of the cars and bikes we expect to see in India in 2017. So double up and go get yourself a copy!